The ultimate aim of human life is self-realization by knowing who am I? All kinds of religious thoughts, theories, preaching and practices help human beings to reach this goal and nothing else. Just as there are many ways to reach a place in physical world like walk, bus, train and so on, there are different paths and methods to reach the goal of life viz., Bhakti, Jnana and Vairagya ( devotion, knowledge and renunciation respectively). Man being a rational being amongst 84 lakh species created by the Almighty attempts to question everything he or she comes across and strives to find answers through reading, questioning the Master, analysis, assimilation and introspection. History of human evolution and civilization is a mere journey in this direction. Spiritual elevation would be a reality only when an individual strives, struggles, survives and succeeds in his efforts to find the truth in his life. In real terms, it is truth and nothing else and truth cannot be in parts and fragments but in totality and in perfect manner without any contradictions and inconsistencies whatsoever. Devotees are of four groups as told by Lord Krishna in Srimad BhagavadGita – Aarto, Jijnasu, Arthardhi and Jnani. One who is engulfed in worries, sufferings and diseases belongs to first category of devotees- Draupadi, Gajendra and many other personalities come to our mind who prayed and cried for God in need, worry, melancholy and found solution, solace and comfort. Equally prominent are the great personalities like Dhruva, Parikshiit, Janaka, Yudhistara and many more who were yearning to know the ultimate truth and attained Janna-knowledge of Soul. Majority of human beings , not with any tinge of regret or inferior feeling belong to such a group who have always acquired and demonstrated over millions of years and Yugas added many to their wish list in spite of fulfilling many desires through the grace of God. We find in this materialistic world this classification of devotees who deliberately chose devotion as a vehicle for the fulfillment of desires. As long as Desires exist and dominate human mind, there will be devotees who worship God for the fulfillment of the same in their lives. Just as waves in the Ocean, these desires do not diminish or subside and they have the tendency to reappear, multiply, accumulate and inundate the human mind for all times with no signs of contentment in sight throughout the life. However, it does not mean that all the devotees belong to this class who always are behind the fleeting desires. Men and women who could understand the transitory nature of desires do not anchor for the same. In the final group, we find a small and miniscule group of the knowers who demonstrate highly gifted qualities and people having enviable degree of inquisitiveness and never satisfying thirst for knowing the deeper and deeper truths of life and beyond. Prahlada, Narada, Sanakasa, Sananda, Nandana, Ambarisha, Pundarika, Ved Vyasa, Suka Parabrahma and many more personalities who from their birth shone in the glory of the Lord and lived and danced in the nectar of Names of God. Everyone in this Universe unquestionably and undoubtedly becomes part of one of these four classes of Devotees. The question often haunting the inquisitive mind is who inspires, motivates and guides the mortals in the path of devotion. Obviously, it is the Master who takes the lead and how to identify the Master is another area of concern. It is repeatedly told by the elders just as the Seeker strives to search and find his Teacher; the later is also equally and more eagerly in his search of the Seeker. Ultimately the meeting takes place and thereafter, things become crystal clear to both and the ways are wide open. In Gita again, Lord amplifies the position of the Seeker. The disciple should approach the Master and Salute him, prostrate on the feet; question the Guru on matters relevant with all humility and with utmost interest to know and also serve the Guru with all the devotion and dedication and only then the Master will readily show the path of realization to the student. In the past, we have come across in scriptures, many devotees attained salvation or Moksha without any knowledge of scriptures or even without any formal initiation into any study by the Guru or the Master. In the great religious place of Srikalahasti in Andhra Pradesh, the place is known for the attainment of Moksha for a spider, snake and an elephant. The Spider did not read or listen to Vedas, the snake did not know any religious books and the elephant also did not recite any mantras but all the three were shown benevolence by the Lord by granting the salvation from the unending chain of birth and death. Adi Sankaracharya in Sivananda Lahari extolled the glory of Lord Siva comparing himself to’ Pasu’- animal and as Pasupathi Lord Siva should show mercy on him. Here Adi Sanakaracharya prayed on behalf of all and not for himself. We may not know grammar, literature, dance, music or any such subjects but if one keeps his intellect, mind and body on the lotus feet of the Lord, then everything else turns out to be easy and clear. In another place in Sivanandalahari stothra, Adi Sankaracharya vividly brings out the need to fix our concentration on the feet of the Lord even though we may take the birth of God, men, animals, mountains, insects and so on, the aim of everyone should be to pray and nothing more and in what shape one is born is not relevant. Devotion or Bhakti is so simple and easy to practice and all the sins one has committed in his life will stand burnt and uplift him from the deep sea of birth and death as in case of Ajamila in Sri Bhagavatam. 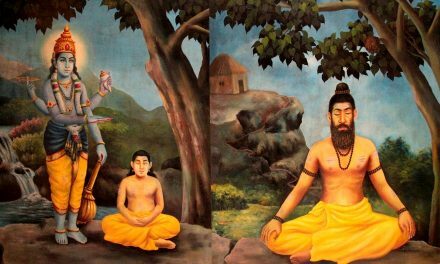 Throughout his life, he spent in all possible sinful activities, never uttered the name of God even once but at the time of his death, he murmured the name of his son Narayana. 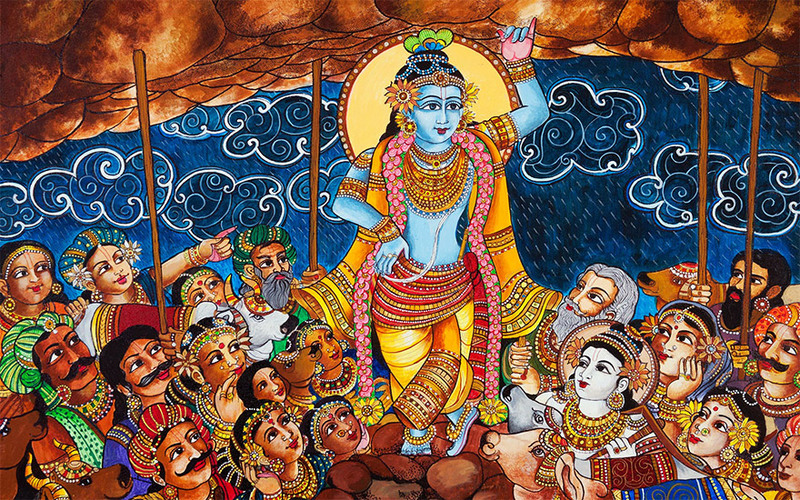 This simple act of uttering his son’s name Narayana absolved him from all sins and took him to heaven and the messengers sent by the Yama had to return. This adequately demonstrates the need to chant the name of Lord Everyday without waiting for the last day of life which is not known to us. That is why Adi Sankara emphasizes the need to do Bhajan, have friend ship with good people, read at least once Gita, have sip of Ganga Water and pray lord at least once in life. Many simple things are laid out for all of us in Bhajagovinda Stotram. Prahlada preaches his fellow students about the need to have devotion and do chanting of the names of Lord Vishnu without wasting life in transitory affairs. Division of 100 years of human life into four stages viz., childhood, adolescence, youth and old age and describing the different activities like having material enjoyments with wife, children, relations, wealth, possessions and all other material attractions before one realizes no time is left for lasting and self- realizing actions. Age fleets and moves fast taking human being nearer to the end of life and all the actions performed in life prove to be futile and meaningless serving no purpose and the priceless human life is spent in transitory and fleeting activities. Prahlada, therefore, exhorts in Srimadbhagavatam the need to delve on the name of God, chant the name of God and perform all such deeds which help in realization. In Gita, we find a great expression on the elevated presentation of ways of devotion in Bhakti Yoga-12th chapter. Knowledge is superior to mere practice of rituals, meditation is superior to knowledge and renunciation is superior to meditation. It is clear that once renunciation of fruits of action is sacrificed, peace returns to human being. In this narration, one should understand that mere bhakti or performing rituals may lead to nowhere, and knowledge may lead to arrogance and meditation stabilizes the mind in goal and finally thyaga or renunciation may bring lasting peace immediately. In the ultimate analysis, the most fruitful and instantly rewarding form of devotion is “Saranagati”- taking refuge under the kindness of God. Many personalities resorted to this mode when it was proved that conditions were beyond their capacity and control and their energy levels were far inadequate to combat, fight and achieve the result. Gajendra, king of elephants fought for thousand years in water with crocodile and felt his energies debilitating, diminishing and quite inferior to that of the increasing strength and capabilities of the Crocodile in the water. Then he prayed for help, protection and salvation to the Lord in nameless, shapeless but the Omnipotent, Omnipresent and Omniscient. Lord Vishnu who is considered by Sruthi as the ultimate protector of the creation came to his rescue and proved his title of the savior of the Saranarthi – who surrenders at the feet of the Lord for protection and salvation. I do not want to denigrate the author but certainly want to kindle tangential thoughts. Because he is also conditioned to think the way he has written. Author has quoted Gajendra moksham, Sivanandalahari, Prahlada and so on and claims saranagtahi as the ultimate. He is translating BAKTI as devotion. But sanathana dharma can not be compartmentalised the way ot has been done in this article. Since no one know why one is born at a time, place, back ground one is born , and one lives nby the means one is engaged either by choice or chance, BUT every one wants happiness there are certain processes defined, process adherence is stressed and consequence management is enforced through paapa and punya karmas and karma phala resulting in subsequent suffering. Neither Muslims nor CHristians believed in this structure, committed untold sins, murders, usurpation if land but never paid karma phala. WE NEED TO REALISE THERE ARE TWO GOALS. (1) HOW TO LIVE SO THAT ALL ARE PROSPEROUS, AUSPICIOUS, HAPPY AND WE TOO ARE (2) HOW TO LEAVE THE WORLD WITHOUT ANY DISAPPOINTMENTS, ANGER, SUFFERING AND CULULATIVE HATRED. Sanathan dharma precisely guides us to achieve these 2 goals as away of life. living as per defined processes. Shradhdha (devotion) Viswasam (faith), bakthi (emotional commitment) , karma (actions as permitted) are all required. Beautiful description voting for the Saranagati mode of devotion is absolute and that is jnana. the choice of devotion depends on the inner urge given the Divine which is always present in all. It is the need to activise the divine and seek for awakening. Surrender and and giving up personal ego helps a lot and it is the need for god. In gita Krishna said na me bhaktah pranasyanti and therefore any one who does dood (kalyana krut) shall shine and reach up the goad . It is sure because dhatuh parasada renders support to him. It does not matter the janma in a sense whether animal or man. Every being is eligible for relief in any form they are given by the god. It may be spider serpent or an Elephant or Man or Daitya. if the good urge is there realisation and elevation is definite. The ultimate is not knowing about self or Atma but knowing about Parmatma, atma, the ultimate goal the ways and means of obtaining the final goal and the obstructions for reaching the final goal or objective. This is called arthapanchakajnaanam. Bhagavat Chintna Amruta Paanam without having any desire in mind even desire for Mukti. (salvation). Thus a true devotee surrenders to Eswara in totality. his mission was only Lord Rama. He introduced as Rama Sevak(servant) before Ravana.